There is so much value in allowing students to discover new concepts on their own, complete their own research, and teach others. New teaching methods might become the fad, but good ol' methods still work just as well. Cue: the jigsaw method. There is ALSO a whole lot of value in writing in the content areas. While writing about your weekend, summer, favorite memory, etc. is all good and well - writing good informational pieces is what prepares you for the real world. Remember that one time in college when you wrote about your surprise birthday party?! Me neither! Each student also received a research sheet and a planning sheet on their way to the computer lab to access the online research library. I completed this task with my fifth graders, and we all know what happens when students "research" information: they want to copy down every.word.that.they.read. I don't blame them - I did the same thing at that age! The research sheet that I gave them has bullet points, and I tell them to write down fragments instead of entire sentences. This helps them put it into their own words later on. Once their research was complete, they transferred their knowledge to the planning sheet. They were asked to come up with three different paragraphs. 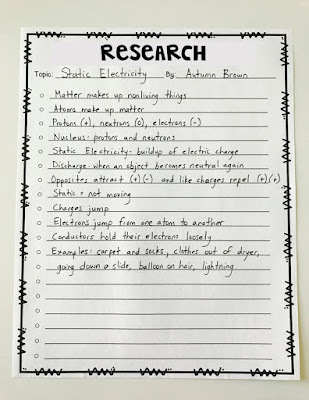 One of the easiest ways to do this is to have students write a 1, 2, or 3 next to each bullet point on their research list. Sidenote - yes, students will struggle. Yes, some of the information that they read goes way above their heads. It took me a long time to accept the fact that they SHOULD struggle a bit. It's how they learn! Yes, I did help the students that needed extra guidance, and I also allowed students that were researching the same topic to compare notes. Some chose to plan their writing independently, and some chose to work with a partner. I checked all of the planning pages and conferred with each student for a few minutes to make sure that they were on the right track. The better their planning - the easier the writing will be. Students understood this fact very quickly once they actually started writing! 1. Time. There is never enough time. 2. Kids absolutely HATE writing a paper and then REWRITING it again. I would too. Disclaimer: not all papers looked like Autumn's. Some needed extra space, and some wrote half of a page. It's OK! They learned A LOT from this activity! After the class was finished, each jigsaw group member presented their findings to other group members. They made my teacher heart happy. After this activity, I taught them the unit. They retained the information so much better, and they were SO EXCITED to offer more input as I talked about each topic. 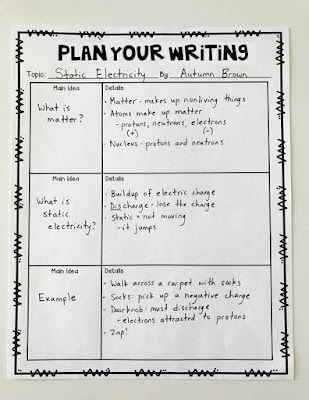 You can also use this writing activity at the end of your unit as an independent learning activity.